Despite the more inclusive economic and social agenda initiated by South Africa’s democratic government after 1994, enjoyment of the rights laid out in the Covenant on Economic, Social and Cultural Rights and the South African Constitution remains elusive for the majority of South Africans. 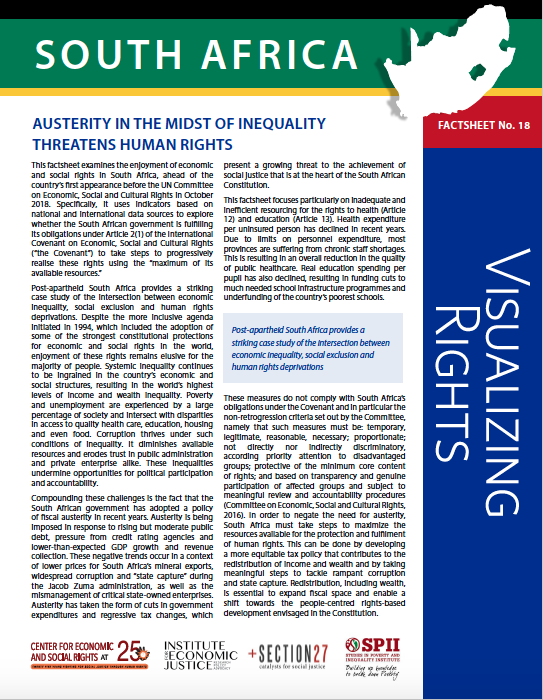 This factsheet, accompanying a submission made on the occasion of South Africa’s first appearance before the Committee, finds that austerity policies in the context of extreme inequality present a grave threat to economic, social and cultural rights. Austerity is being imposed in response to rising but moderate public debt, pressure from credit rating agencies and lower-than-expected GDP growth and revenue collection. Austerity has taken the form of cuts in government expenditures and regressive tax changes, which present a growing threat to the achievement of social justice that is at the heart of the South African Constitution. This factsheet focuses particularly on resulting inadequate and inefficient resourcing for the rights to health and education. Health expenditure per uninsured person has declined in recent years. Due to limits on personnel expenditure, most provinces are suffering from chronic staff shortages and an overall reduction in the quality of public healthcare. Real education spending per pupil has also declined, resulting in funding cuts to much needed school infrastructure programs and underfunding of the country’s poorest schools. Systemic inequality continues to be ingrained in the country’s economic and social structures, resulting in the world’s highest levels of income and wealth inequality. Poverty and unemployment are experienced by a large percentage of society and intersect with disparities in access to quality health care, education, housing and even food. Corruption thrives under such conditions of inequality. In order to negate the need for austerity, South Africa must take steps to maximize the resources available for the protection and fulfillment of human rights. This can be done by developing a more equitable and progressive tax policy that contributes to the redistribution of income and wealth and by taking meaningful steps to tackle rampant corruption and state capture. Redistribution, including wealth, is essential to expand fiscal space and enable a shift towards the people-centred rights-based development envisaged in the Constitution.